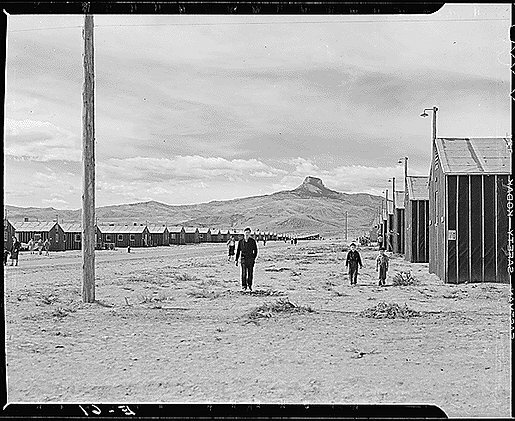 The Heart Mountain Relocation Center was one of the ten American concentration camps for Japanese Americans during World War II. The center was located 12 miles northwest of Cody, Wyoming. It was opened in August 11, 1942 by the War Relocation Authority. Sixty two percent of the inmates were American Citizens. For those who would like more details about these images, go to the National Archives website at http://arcweb.archives.gov/arc/action/BasicSearchForm. Hit "Digital Copies" and set limit to 1000. Type in "Heart Mountain Relocation Center" and hit search. RoyKakuda — Last modified Oct 19 2017 7:51 a.m.